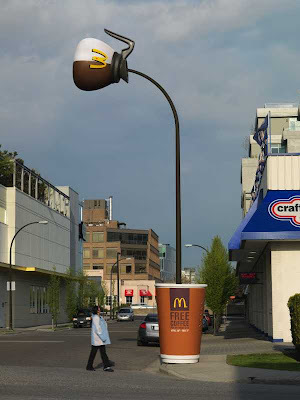 Vancouver Street Scene: Now that's a lamppost! via Marc Van Wegeningen's DirectDaily blog. 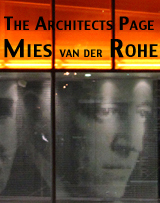 Pecha Kucha Architects Night, Tuesday the 29th, at Big. Bold. Visionary. 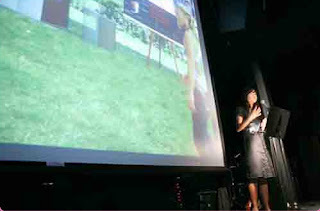 A reminder that Tuesday, September 29th, will see an architecture-centric edition of Pecha Kucha Chicago, where presentations are brisk and visual, each one done in 20 slides at 20 seconds each. The special Burnham Plan Centennial edition will take place at the Chicago Tourism Center, 72 E. Randolph, site of the exhibition, Big. Bold. Visionary. 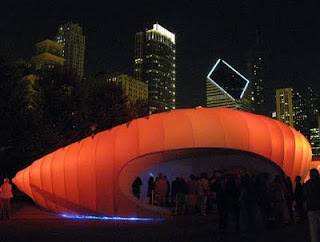 Chicago Considers the Next Century. Presenters for the night are scheduled to include both Tracey Dear, the architectural lightning designer whose colorful nightime illuminations added magic to the two Burnham Pavilions designed by Ben van Berkel/UNStudio and Zaha Hadid, and Thomas Gray, whose striking short film on Burham and Chicago was invisible during the largest part of the summer in its intended venue, the pavilion by Zaha Hadid Architects, because the design leaked so much daylight into the interior as to make daytime projection impossible. Also on the schedule is a presentation by cartographer and historian Dennis McClendon. 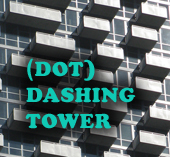 Kyle Reynolds of Valerio Dewalt Train Associates whose projects include the Garmin Michigan Avenue Flagship, and the ghostly Miglin Staybridge Suites Hotel in River North Chicago. Brad Lynch of Brininstool + Lynch fame. Michael Wilkinson of WilkinsonBlender fame. 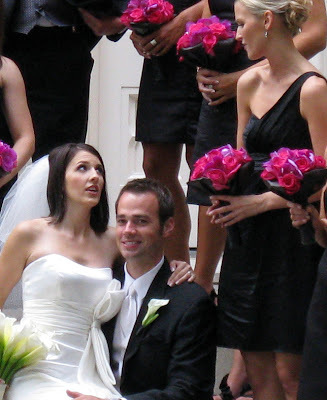 Elva Rubio, formerly of Gensler, and co-founder of Bruce Mau Design's Chicago Studio. 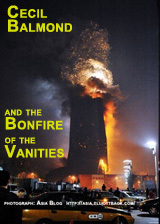 And, on a down note, there will also be . 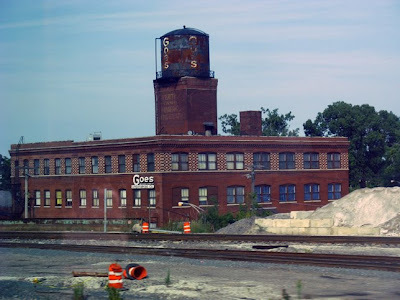 . . me, talking about what may be Chicago's last great show, the 1948-49 Chicago Railroad Fair. On the plus side, I'll have pictures to divert you from my Ben Stein-like drone. 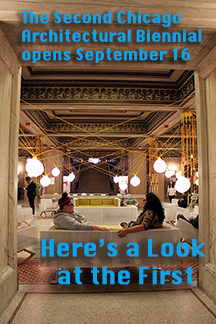 Again, it all takes place this Tuesday, September 29th, at the Chicago Visitors Center, 72 E. Randolph. Doors open at 6:00 p.m., program starts at 7:00 p.m., concludes by 9:00 p.m. or so. The co-emcees will be Pecha Kucha Chicago's Peter Exley and Julie Burros, Director of Cultural Planning, City of Chicago Department of Cultural Affairs. Tickets are $25.00, and can be purchased here. And, by the way, the Big. Bold. 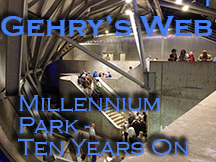 Visionary exhibition has been extended, through October 11th. We hope to be writing more about it soon (apparently there's a law I can't write about an exhibition until just about when it's supposed to close - I think it's a federal law.) It's an important show with a lot of great work from of Chicago's most creative architectural minds, whose concepts will engage you and encourage your own thinking on where Chicago's future should lie. Here's a shameless plug for a great event this Friday, September 25th. From 6:00 a.m.(!) to 3:00 p.m. in Pioneer Court just south of Tribune Tower on Michigan Avenue, under the approving eye of the big guy with the pitchfork and his friend the metallic moose, you can take just a minute, and as little as $10.00, to support one of Chicago's great unsung treasures, the Off the Street Club. 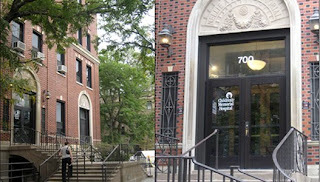 Since 1900, the club has been acing its goal of providing "a safe, supportive, Loving environment" for kids who spend most of their lives in the mean streets of one of the city's toughest neighborhoods - one of the most dangerous in America - West Garfield Park, where 8 out of 10 kids have seen gunshots fired at a loved one. The Off the Street Club is Chicago's oldest boys and girls club, serving over 3,000 kids with a wide range of programs that range from tutoring and mentoring, to athletics, computers, arts and crafts, and a Girl's Center where high-profile speakers and role models help young women set and achieve personal goals. 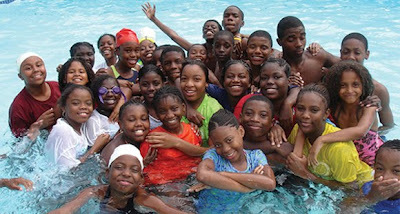 In the summer, " kids get to trade in the violence and drugs of their neighborhood for cookouts, sing-alongs, swimming, hiking and horseback riding." In the winter, there's skiing, sledding and other sports. And it works. 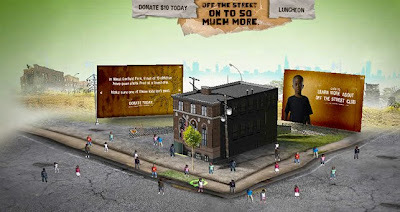 I've been lucky enough to meet a number of Off-the-Streeters, and they're great kids. You can see the club's success in their eyes and their manner. They have what long-time OTSC director Ralph Campagna calls "casual joy . . . a certain look that a child has in his or her eyes when they're loved and safe and know it. And we have too many kids who come to us and don't have that look, who haven't found it." Again, Friday, September 25th, 6:00 a.m. to 3:00 p.m., Pioneer Court, you'll be able to adopt the Off the Street Club kid of your choice for $10.00. That's right, for not much more than a couple Frappachino's and less than an Ermenegildo Zegna collar stay, you can buy snacks for five kids for an entire summer. A single Alexander Hamilton earns you our eternal gratitude, but should there be larger denominated Presidents looking to escape the darkness of your wallet, $25.00, for example, will add six new books to the OTSC library. And so on and so on. You can't miss us. 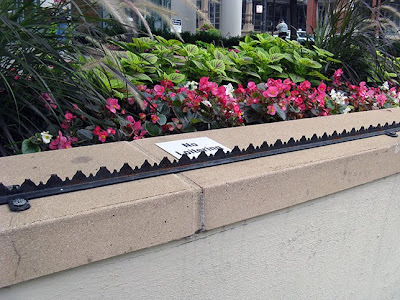 Just head to Pioneer Court and look for all those cut-outs of Off the Street Club kids, select the one you want to adopt, and let some very nice volunteers - the really fun people I work with every day, including the cream of Chicago's creative crop - take a small smidgen of your money. A small smidgen that, trust me, will do a world of good. via Engadget, Stepford People try to enlist you to host Windows 7 launch parties. Is it just me, or does this make your blood run cold? Comments are disabled for this on its You Tube page. I wonder why. 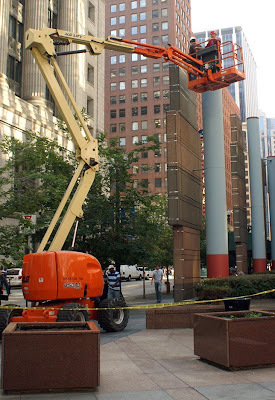 Courtesy of our indefatigable correspondent Bob Johnson, we give you the above look at the work being done on the gabled roof of Holabird & Roche's 1912 Monroe Building, part of the historic Michigan Avenue landmarked streetwall. 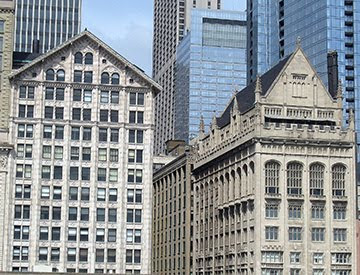 It's one of a pair buildings, the other being Holabird & Roche's University Club just to the north, that straddle Monroe Street to form a visual gateway to the Loop. 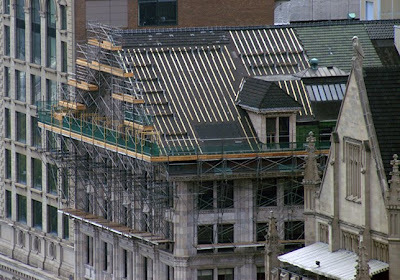 The roof work is part of major renovations to the Monroe, which was originally intended to be a residential conversion, but now appears to be sticking with offices. 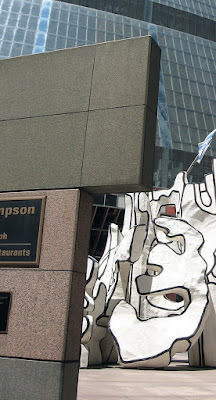 According to Tim Samuelson's excellent history on the Monroe Building's website, the offices in the top floor loft just under the peak of the gable roof have been home to a range of luminaries, from Walter Burley Griffin, to Barry Byrne, Alfonso and Margaret Ianelli, and, for a brief period, Frank Lloyd Wright himself. The conclusion of Mike Leigh's magnificent Topsy-Turvy, with the wonderful Shirley Henderson. Recognize the (to say the least) eccentric dance master? More excerpts on You Tube here. It's a minor scandal this film is not currently available on DVD, but you can find copies on Amazon. From the press release . . . The Art Institute of Chicago is pleased to announce the appointment of Alison Fisher as the Harold and Margot Schiff Assistant Curator of Architecture in the Department of Architecture and Design . Ms. Fisher, who arrived at the museum in August 2009, will join Joseph Rosa, the John H. Bryan Chair of Architecture and Design, and Zoë Ryan, the Neville Bryan Curator of Design, in organizing exhibitions, conducting research, and managing acquisitions for the museum's extensive collections of architecture and design. Ms. Fisher will focus on the Art Institute's historic architecture holdings from 1850 to 1945, thus overseeing the architectural drawings, models, and archives of many of America's most important architects, such as Frank Lloyd Wright, Daniel Burnham, and Louis Sullivan. Fisher curated a very fine recent exhibition at the Block Museum in Evanston, Marion Mahony Griffin: Drawing the Form of Nature, with a good catalogue, which recent shows at the AIC have been sorely lacking. Let's hope. 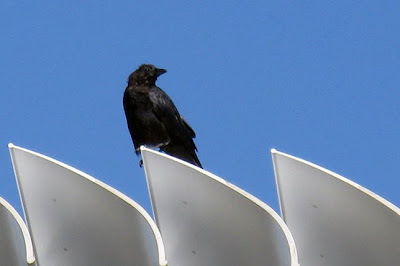 Quoth the Bird on the flying carpet: Nevermore! Just when we think I've finally put the September calendar to bed, they pull me back in! 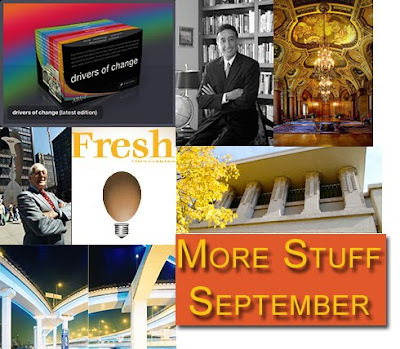 Here's still another set of great events we've just added to the September calendar. 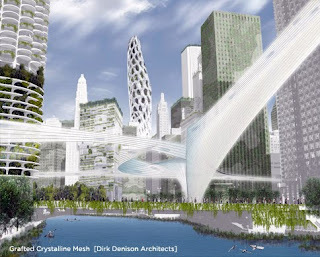 On Monday, the 21st, Chris Luebkeman, ARUP's Director for Global Foresight, lectures at Fullerton Hall at the Art Institute, and there's an encore showing of the documentary Fresh at Archeworks on Tuesday the 22nd. On Thursday, the 24th, there's an opening reception and lecture by Olivo Barbieri for Reversed Images: Representations of Shanghai and its Contemporary Material Culture, at the Columbia College Museum of Contemporary Photography, and on Friday, the 25th Henry Cisneros appears at the Hull House Museum to discuss his new book, From Despair to Hope: Hope VI and the New Promise of Public Housing in America's Cities, for the National Public Housing Museum. This was already a week absolutely crammed with great events. 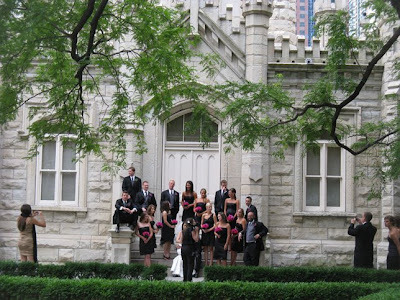 Also on Friday, the 25th, Preservation Chicago holds is Autumn benefit in the spectacular Elks National Veterans Memorial, and the next night, the 26th, the centennial of Unity Temple is celebrated with a gala that concludes with the premiere of composer Peter Lieberson's The Coming of Light. On Sunday, there's a panel discussion, The Future of Glessner House and the Prairie Avenue district, at the Prairie Avenue Gallery in the historic Keith House, where a great exhibition of concepts for temporary installations at Glessner House and adjacent sites by second years Master of Architecture students at the School of the Art Institute runs only through September 27th. Also at Glessner House on Wednesday the 23rd there'll be a panel remembering the great Leon Despres. Both the American Planning Association and AIA Women's Leadership Summit are in town for multi-day conferences, and SEAOI has an an-day seminar on structural glass on Monday. But wait: there's more! Nearly two dozen events just this week, and no I'm not putting links in this post - football is on. 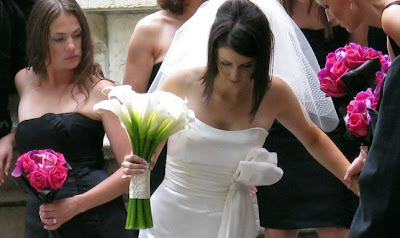 But you can check it all out - links, in abundance - here. Attacked while researching the names of children killed in collapse of shoddily constructed schools in 2008 earthquake. Via archinect, Speigel and twitter. Sara Corbett has a great piece in today's New York Times Magazine of the story of Carl Jung's The Red Book, the product of the Swiss psychologist's dark night of soul, 16 years of recording's immersion in his own "troubling visions and . . . inner voices." 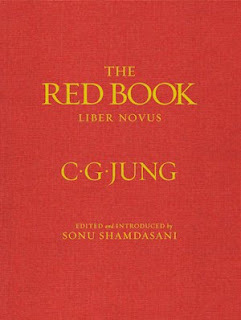 For the better of a century, Jung's book has been withheld from publication, the last 23 years in a Zurich safe deposit box. Now, however, The Red Book, named after the color of its cover, is set for a mid-October release, complete with an English translation and copious footnotes by scholar Sonu Shamdasani. At $195.00 list, it'll be no cheap thrill, but Amazon is taking pre-orders for $105.30. 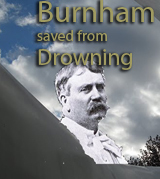 The samples of the fantastic illustrations up on Amazon seem a cross between William Blake and H.P. Lovecraft. 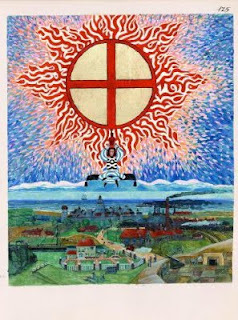 When I was young, I found myself fascinated by Jung's work and thought, making my way through most of the volumes in the spare, handsome designs of the Bollingen series from Princeton University Press. They've been up on shelf, untouched, ever since, through all the subsequent years of debate on whether Jung was a seeer, mystic or charlatan, but early obsessions seldom lose their power entirely, and I've got my order in. Read Corbett's The Holy Grail of the Unconscious here. There's an amazing movie in there, but I doubt the Jungs will approve. 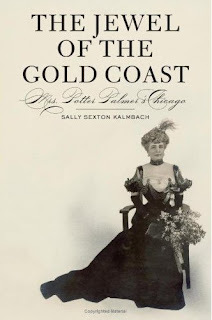 Saturday, September 19th at The Hinsdale Market antique shows benefiting The Community House in that suburb, historian Sally Sexton Kalmbach will be signing copies of her new book, The Jewel of the Gold Coast: Mrs. Potter Palmer's Chicago. 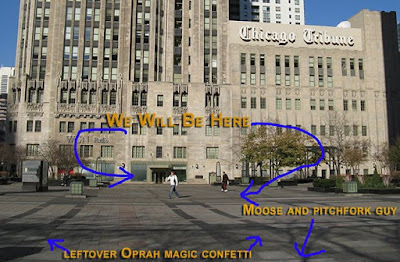 Bertha Honoré Palmer, even without a mega-popular television show, was the Oprah of her day, - the "Queen of Chicago". For nearly half a century, from her 1870 marriage to Potter Palmer, creator of both State Street and the Gold Coast, to her death in 1918, she was one of the city's most energetic and effective movers and shakers. The book is also on sale at the Chicago History Museum, whose own exhibition, Bertha Honoré Palmer, up through January 4th, displays a selection of Palmer's personal effects and gowns that "are among the most opulent examples of late-nineteenth and early twentieth-century dress." And if you prefer roses with your history, you can also pick up a copy of The Jewel at Mangel Florist in the Drake Hotel, 140 east Walton, which will be the departure point for Kalmbach's walking tours of the Gold Coast, Friday, September 25th from 2 to 4:00 p.m., and again on Saturday the 26th from 10:30 a.m. to 12:30 p.m. Email Ms. Kalmbach for more information. 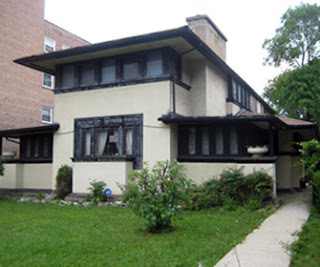 Sunday, September 20th, the Edgewater Historical Society will be offering it's 2009 Edgewater Home Tour, including a tour booklet and map for a $25.00 per person donation. This year the tour focuses on the Magnolia Glen neighborhood, and includes the twin John Gauler houses, from 1908, designed by Walter Burley Griffin. Both exteriors and interiors will be featured, with a docent at each house providing its history and describing its features. Reservations are not required. Register at Bethany Lutheran Church, 1224 W. Avenue between noon and 3:00 p.m.
To be presented at the Four Seasons on December 3rd. 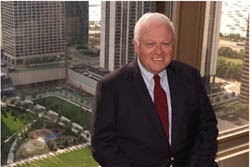 The Lifetime Achievement Award honors an individual whose achievements throughout his or her lifetime exemplify personal and professional contributions to the real estate industry and to the community. 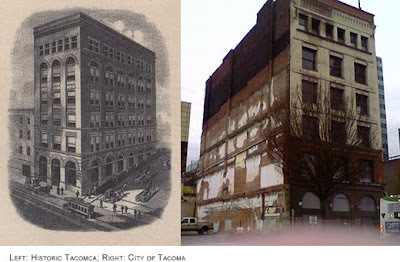 Less than two years from an announcement of what would be prove an abortive $6 million renovation plan, the now abandoned Luzon Building, designed by Burnham and Root in 1891 for the Pacific National Bank, has been declared a "dangerous building" in danger of collapse and will be demolished later this month. 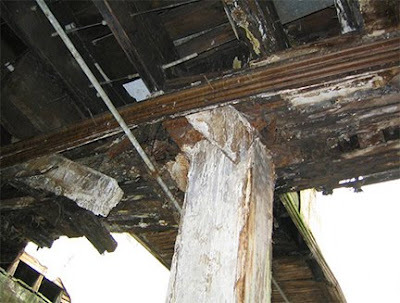 According to biographer Donald Hoffman, the six story building, on a sloping site, is actually of timber construction, as can be seen in this photograph from an engineering report from Swenson Say Faget that documented the structure's current sorry state. The firm's work survives in two buildings in San Francisco, the Mills Building, and the Chronicle Building, recently renovated as part of a new Ritz-Carlton Club Residences. 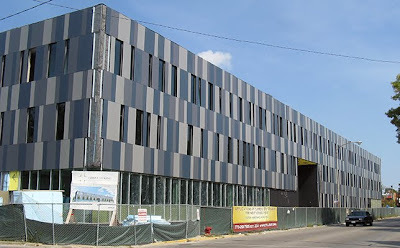 Architect John Ronan's 100,000 square foot Christ the King College Preparatory School, edging towards completion in Chicago's Austin neighborhood, has two major components. The northernmost leg, along Leamington Street, is an athletics center dominated by a large gymnasium and topped off by a 20,000 square foot green roof. 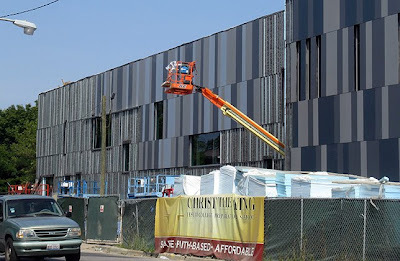 The eastern end of the academic wing floats above a 200-seat chapel wrapped in glass block. 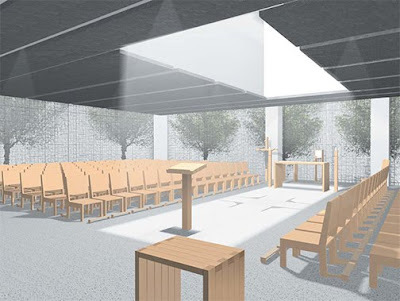 A skylight makes the sacred space between the ambo and altar the chapel's radiant center. 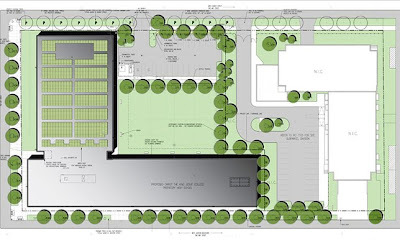 The two wings form an "L" which is mirrored by the traditional architecture of an existing older middle school and auditorium, enclosing a courtyard landscaped, as is the rest of the complex, by Terry Guen Design Associates. 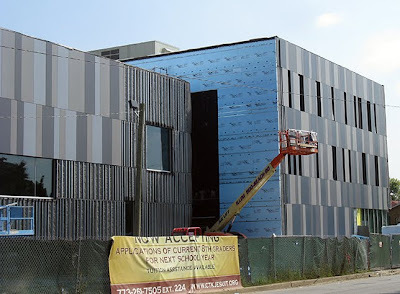 The new school is of steel frame and concrete construction, with facades of the same type of fibre reinforced concrete panels that appear on Ronan's Gary Comer Youth Center in Grand Crossing, but with a much more subdued palette. Three houses designed by Frank Lloyd Wright and a church designed by Edward Dart are among nine items making up Landmarks Illinois's 2009-10 Chicagoland Watch List of endangered landmark-quality architecture. 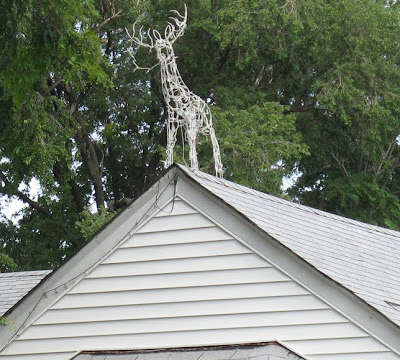 The Wright work includes the J.J. Walser House in Chicago's Austin neighborhood, plus the Ross house in Glencoe and VanderKloot bungalow in Lake Bluff. 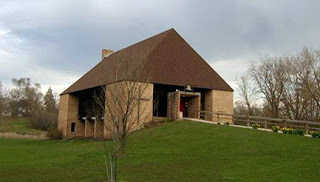 Dart is represented by the 1963 Church of the Resurrection in West Chicago. 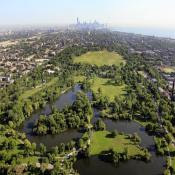 Also included are Chicago's South Side Masonic Temple, A. James Speyer,'s Rose house , the modernist Highland Park home that was a supporting character in John Hughes' film Ferris Bueller's Day Off, and the "Lincoln-Fullerton"
streetscape, composed of a large number of buildings that will be left behind after Children's Memorial Hospital moves to its new billion dollar facility currently under construction east of Michigan between Chicago and Superior. You can see the entire list, with detailed descriptions and a generous selection of photographs, here. For those of you still contending the American health care system isn't seriously whacked, check out the great story in this weeks Crain's Chicago Business: Hospitals' new case race: stroke patients. It seems hospitals are falling over themselves ramping up the cutthroat competition to grab a big piece of stroke care because, as Willie Sutton once said about banks, it's where the money is. "Average profits on a stroke case range from $2,800 to $4,000," reports Crain's. Mike Colias's report doesn't appear to be available on the web for non-subscribers, but it's well worth plunking down $3.50 for Crain's September 14th issue, not just for the stroke story, but for an account of City Hall's proposed $40 million bike path, Kraft's quest for Cadbury, and more. 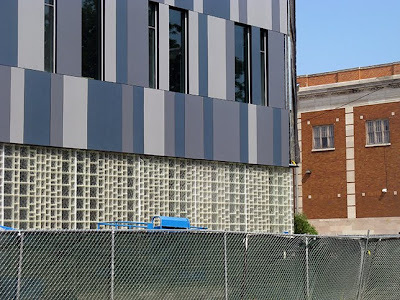 Is this the architectural equivalent of holding things together with scotch tape? 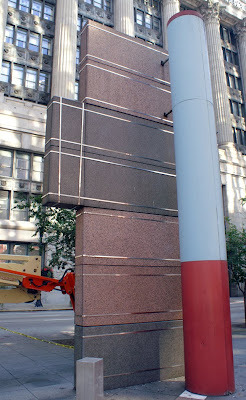 Nearly a quarter century after the building's opening, the pink and gray granite panels on the monoliths at the James R. Thompson Center are being corseted in securing grids of It Straps On stainless steel banding, appearing to confirm a comment from one of our readers on our previous post that there's a fear of the panels popping off. 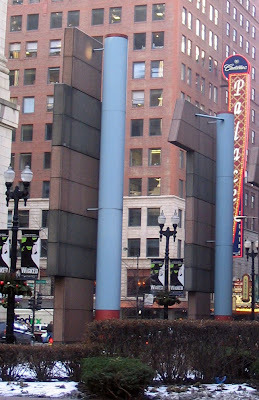 The distinctive monoliths deconstruct the base walls, shrinking progressively in height as they head towards the corner of Clark and Randolph. 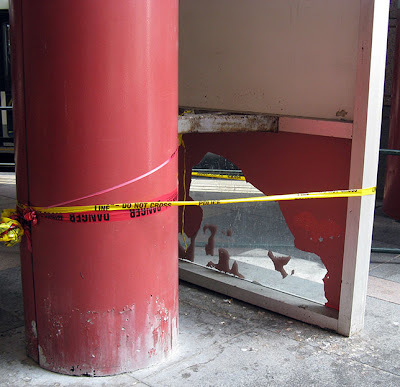 Judging from the state of glass panels at the bottom of some of the columns, the arcade hasn't exactly been treated with tender loving care down through the years. 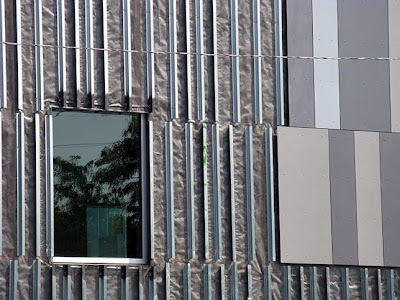 When catching the sunlight, the metallic bands add another layer of glitz to Helmut Jahn's controversial design. Is this going beyond rescue, into the realm of commentary? Just as we think we're finally putting the September calendar to bed, there's still more events to be added. 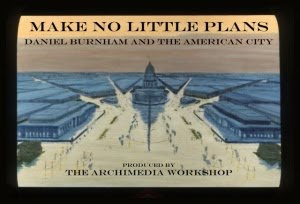 It begins this Tuesday, September 15th, with another chance to see Judith McBrien's new documentary Make No Little Plans: Daniel Burnham and the American City, at 6:00 p.m. in the Cindy Pritzker Auditorium at the Harold L. Washington Library, 400 South State. 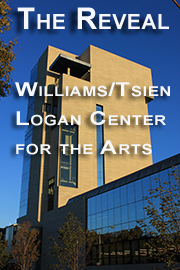 After the film, Lee Bey will engage director Judith McBrien in a discussion. This is the first of four new screenings of the documentary throughout Chicago: October 1st at 6:30 p.m., at the Sulzer Regional Library, 6:30 p.m. on October 7th at Woodson Regional Library, and 2:00 p.m., on October 25th at the Burnham designed DuSable Museum in Washington Park. View the trailer here. The following Tuesday, September 22nd, Archeworks will host a screening of the new film Fresh, which "celebrates the farmers, thinkers and business people across America who are reinventing our food system." 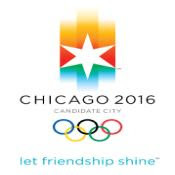 6:00 p.m., RSVP strongly recommended, $3.00 suggested donation. View the trailer here. Check out the entire September calendar here. Finally, Frank Lloyd Wright and the Three Golden Ages, is now open at the ArchiTech gallery, where it runs through December 26th. 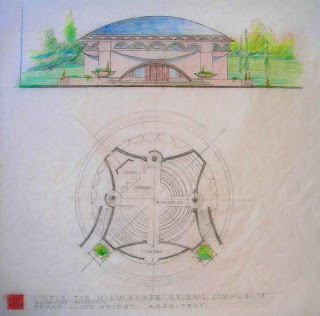 Please note that this has nothing to do with Turandot's three riddles, much less Carl Sandburg's Five Glorious Marvelous Pretzels, but instead includes drawings, photographs and blueprints from three distinct periods in Wright's work - Prairie, California, and the late expressionistic period that culminated in the design of the Guggenheim museum. 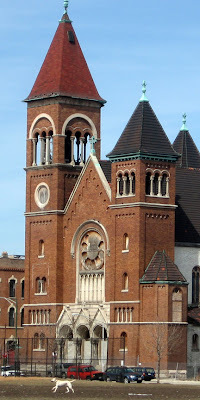 St. Boniface towers to be saved? Via Blair Kamin's blog, here's a link to a ChicagoCatholicNews story from Saturday saying a deal has been reached to save the four towers of the historic, long closed and threatened St. Boniface church, with a senior living complex apparently to be built between them, replacing the former church's sanctuary. 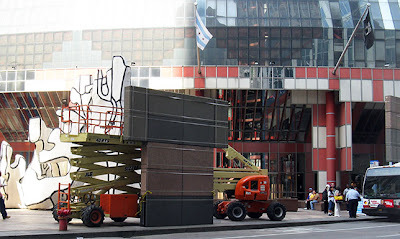 We don't usually cover tours, but the Chicago Architecture Foundation is offering an interesting three and a half hour bus tour this Sunday, September 13th, at 9:30 a.m., of the sites that would be deployed for a 2016 Chicago Olympic, including those in the Kenwood, Hyde Park and University of Chicago neighborhoods, plus a tour of H.H. Richardson's Glessner House. The price, coincidentally enough, is $20.16. Meet 20 minutes before departure at the CAF Shop and Tour Center at 224 S. Michigan. Info and registration on-line. 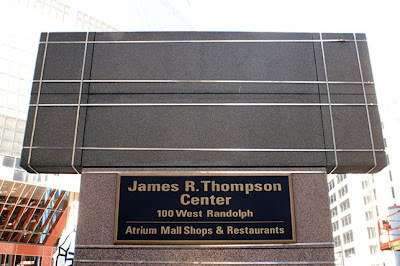 Vandalism or improvement: Do Thompson Center columns need those bands of gold? Carmine said one Thwack; here are three!